Heeft u een vraag voor Diamond Cliff Beach Resort? Of u nu een toerist bent of zakelijk reiziger, Diamond Cliff Beach Resort is een uitstekende accommodatie tijdens een bezoek aan Koh Lanta. Het levendige stadscentrum is slechts 22.6 km verwijderd. Met de belangrijkste attracties van de stad - zoals Klong Nin Beach, Nui Beach, Baan Klong Tob Klein Ziekenhuis - binnen handbereik, zullen bezoekers van de accommodatie de locatie zeker waarderen. Niets is te veel voor Diamond Cliff Beach Resort om het haar gasten naar de zin te maken. Zo biedt deze accommodatie de beste services en voorzieningen. Om gasten een maximaal comfort te garanderen biedt de accommodatie gratis wi-fi in alle kamers, dagelijkse schoonmaak, bagageopslag, wi-fi in openbare ruimtes, parkeerplaats. Alle accommodaties beschikken over goeddoordachte voorzieningen om een ongeëvenaard gevoel van comfort te garanderen. De accommodatie biedt talrijke recreatieve mogelijkheden, zodat u voldoende te doen heeft tijdens uw verblijf . Met een ideale locatie en bijpassende voorzieningen, is Diamond Cliff Beach Resort voor veel gasten precies dát wat zij zoeken. It's a perfect romantic getaway for newly weds and those who are looking to rekindle their relationship. The room is nice and very spacious, but does needs some attention to cleanliness. The view of the beach is to die for, catch the sunset at 6:30 to see the sun goes down and disappears behind the horizon. The food at the restaurant was fantastic and well priced with a Seaview , can't get any better then that. The staff are so friendly and hard working, it was a joy to be served by them. Highly recommended. Everything about this place is amazing. The view is to die for. The bed is comfortable, the air conditioner works well, the place is clean and safe, the staff are so nice and will bring your breakfast to your room if you go down and order, the TV has Netflix, The food and drinks is amazing, the private beach is so peaceful and beautiful. There are only 2 rooms here so it is very quiet. We felt very lucky to even have gotten this place. you’re a 10-15 min walk from all the bars, restaurants and resorts. so even if you don’t feel like paying for a bike or taxi, if you’re up for it, you have access to a great bar and restaurant scene by walking. Highly recommend this place! Lots of space, practical amenities, comfy bed, nice deck and amazing view of the beach, sea and sunsets. Great restaurant Located immediately adjacent to the room, great food and excellent service, recruiting dining in the room. Could do with more electrical outlets. Also, very! Steep steps down to the beach; but otherwise a fabulous stay. Highly recommend for any couple. Really friendly staff, one of the managers was very kind and went out of his way to help me, sending someone to get me gasoline when I had run out, researching the weather etc and giving me good travel advice. It was just lovely to stare at the view with a beer in the evenings. we spent 4 days 3 nights at Diamond Cliff and we couldn't be more happy. Beautiful view on sunset from your balcony, private beach, amazing breakfast in bed! Super nice staff and the boss speaks well English. The resort is half way between north and south, rent a bike from the resort and go explore this amazing island. Can't wait to be back!!! We spend 3 days in here and we couldn't fault this place, the only thing that disappoint me was the fact we need to leave and couldn't prolong our stay as the place fully booked. The view is breathtaking, the food is tasty, the cleanliness is well-kept and the staff is super helpful. The location is one of the biggest advantage of this place. 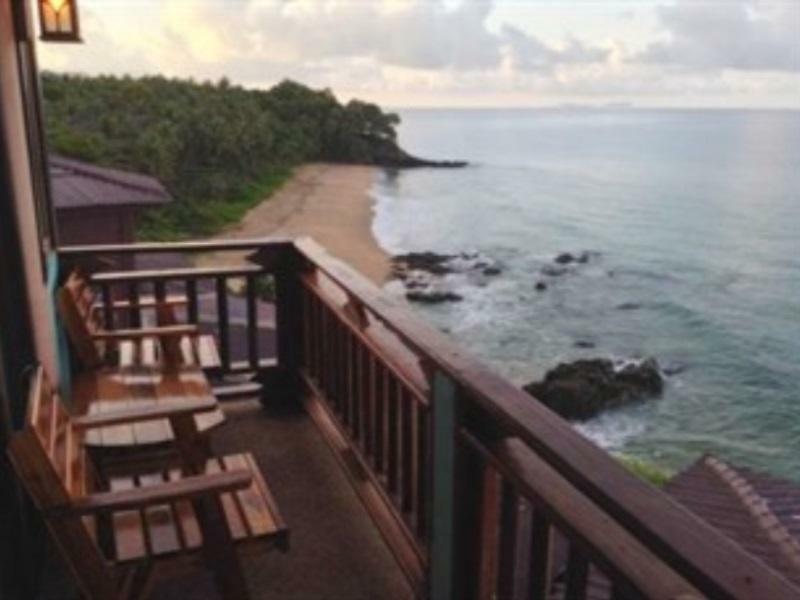 You'll have the spectacular view from a window, and a small lovely NUI Beach just a few steps away. They indeed had a mice problem, but the stuff was doing their best to solve it. The manager was so helpful with our needs. The rooms could be a bit more cleaner. Very good stay overall! I spent three nights in total at this hotel and enjoyed every moment. As soon as I walked into the room I was all smiles with the view. The room is a great size and relatively clean! The owners are very helpful and kind. The location is a bit remote, which makes it great if you want a peaceful and relaxing environment. Also, ensure you have a motorbike so that you can get around with ease. I most certainly would stay here again. The view is wonderful and there is a nice private beach below. The staff was helpful. Their restaurant doesn't have the best food and costs quite a bit. Recommend renting a motorbike and eating elsewhere. They charged 300 baht for a motorbike rental, but other locations only charge around 200-250 baht per day. Overall their prices are not very competitive. Really great and amazing view, good local food. Nice place to hang out and chill for a while. Shower could've been a bit warmer for longer - but that's about my only complaint. Only one of the two rooms is recommendable. In the other room the bathroom had a very bad smell, ceiling tiles falling off and needs renovation. Nonetheless we had the chance to change the room after the first night and the staff was very welcoming and courteous. The a la carte breakfast was served every morning on our balcony and again, the view was fantastic. We were lucky to book the only two rooms of this resort and paid one night stay there. You might be depressed if you were hoping for a holiday resort with 5-star facilities but for us it was really a good guest house for an interesting venture. People, food, room are all great, and needless to say the view of beach and ocean. It must be a great place to take a revisit. 5 stars hotel room feel, great view, great restaurant downstairs, nice beach a few steps down the cliff. Very nice and welcoming staff. Pictures don't do justice. They were fully booked, otherwise we would spend the rest of our holiday there! We stayed at Diamond Cliffs for 3 nights in November. It was great being some of the only guests there since they only have 2 rooms available. The views are spectacular. We were slightly worried about the location at first as there wasn't much within walking distance. However, the owners made it very easy to rent scooters whenever we wanted - we would ask and they would have them either immediately or within 20 mins (helmets included). They also didn't change more for them then we would have had to pay renting from anywhere else on the island, which was appreciated. They were also helpful with organizing taxis for us as well as with various random request we had (laundry, needing supplies when dealing with illness) which made things very easy for us. The beach is nice and was mostly empty when we visited (I'm assuming it gets much busier in the high season). Other reviewers we not kidding when they mentioned the stairs - they are completely manageable but they are quite steep! The Diamond Cliff Beach Resort is beautiful. The name is a bit misleading as it is not a resort, its more of a guest house. The beach is breathtaking and the room is super clean. The family who owns the restaurant and rooms is also very laid back and easy going. They were really nice and accommodating. They even let us have a later check out. We had a few misunderstanding related to shuttle bus which the owners booked for us and it didn't do to our intended location however the owners were quick to help us resolve the issue and we were happy with the outcome. I should note that there was a mouse, gecko and giant beetle in our room. The room is clean but the issue is that the guest room is above the restaurant and overlooks a beach BUT the door leading on the balcony doesn't close properly so animals/insects sneak in. The door needs to be fixed and holes where mice/rats can come in should be patched up. That's my only complaint, for the price mice shouldn't be able to get in. We really loved everything about the resort, the room is modern and clean and balcony view is just breathtaking! Guys who work there are very nice and can provide you with a motorbike, transfer, excursions and all the info you need. Restaurant was on the same level, especially loved my barracuda BBQ :) Would def recommend to all of my friends! We stayed for two nights...in this beautiful small hotel. It has got only 2 rooms. You have to be quick to get one :-) The rooms and the restaurant give you a fantastic view!!! The host helped us to arrange tours...we enjoyed a lot!!! We definitely recommend this place!!! A little south of the centre of Khlong Nin, this is a wonderful secluded spot overlooking a perfect and quiet beach. Friendly and helpful staff, and a lovely quiet room with balcony, the restaurant is very good. Our stay was great in this place. Staff was really helpful, caring and friendly. The room is spacious with a nice private balcony and a great sea view of the sunset. The room is elegantly furnished and freshly remodeled in wooden interiors. The shower is a bit uncomfortable because it is not separated from the wc. The two rooms of the facility are just above the cozy quiet restaurant with a great variety in their menu. From the restaurant you go down some stairs to reach an almost private beach with soft sand and few rocks where you can snorkel. Amazing sunset view both from the restaurant on top of the cliff and from the beach.